Since his election in 2007, Daniel Ortega has gradually restored autocratic rule to Nicaragua. This April, a student rebellion quickly gained the support of much of civil society and organized business. Ortega's security forces responded by shooting hundreds of protesters. The international community reacted with outrage, but so far Ortega stands tough even as the economy spirals downward. Prof. Feinberg, who recently visited the country, will address the question: What can be done to avoid a deepening tragedy for the long-suffering Nicaraguan people? Richard Feinberg is a professor of international political economy at UCSD's School of Global Policy & Strategy (GPS). 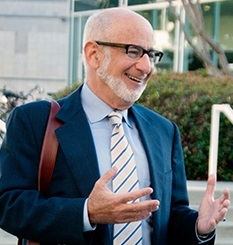 Dr. Feinberg has enjoyed a distinguished career as diplomat, policy advisor, corporate consultant, university professor and author of over 200 books and articles on international relations. His four decades of engagement with United States foreign policy spans government services — in the White House, Department of State and Department of the Treasury — numerous Washington-based public policy institutes, the Peace Corps in Chile and, now, academia.